Peter McLeod has worked in fly fishing travel for over 20 years., visiting over 60 operations in 20 different countries in his quest to find the finest fly fishing experiences available. 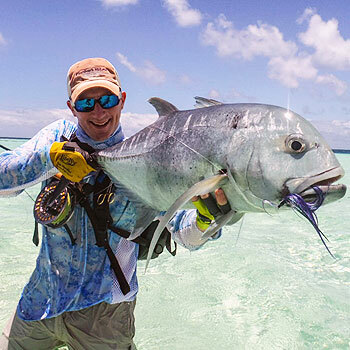 Peter McLeod is the first person to write a comprehensive guide on fly fishing for giant trevally or “GT”. Catching one of these fish is the pinnacle of flats fishing. Join us as Peter leads us on a quest for this brutal apex predator. He founded Aardvark McLeod international fly fishing specialists in 2005. He started as a salmon guide in Norway at 16, but over the last 18 years saltwater fishing has become his prime focus. His fascination with trevally species is bordering on the obsessive and he is constantly scouring the globe for that next mind-blowing hotspot to target these bull dogs of the flats. Peter is a longstanding member of the Hardy Pro Team and was involved in the testing and development of the Proaxis Sintrix rods. He consults for Fulling Mill flies, Rio fly lines, Gillz clothing and has been actively involved in developing a number of new fishing operations around the world. For him it’s all about the fishing and the pleasure of sharing those experiences with others.